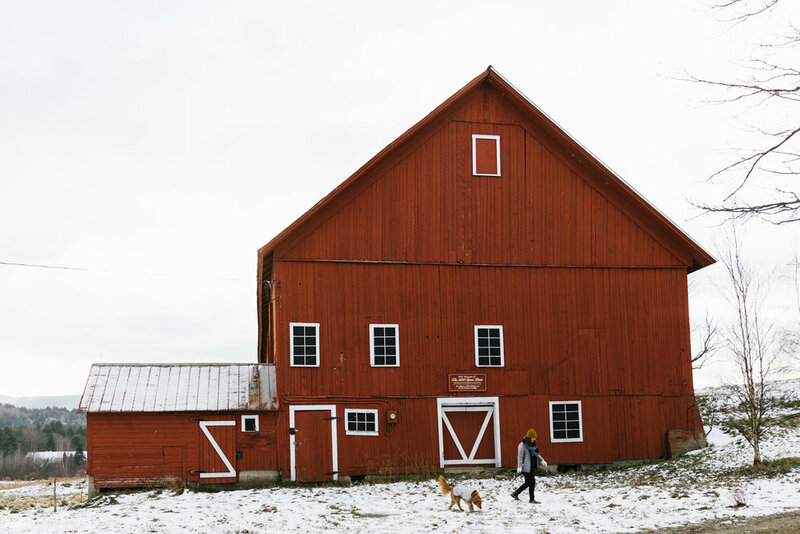 Last weekend, my friend Michelle joined Elsie and me on a little dog-friendly getaway in Vermont. 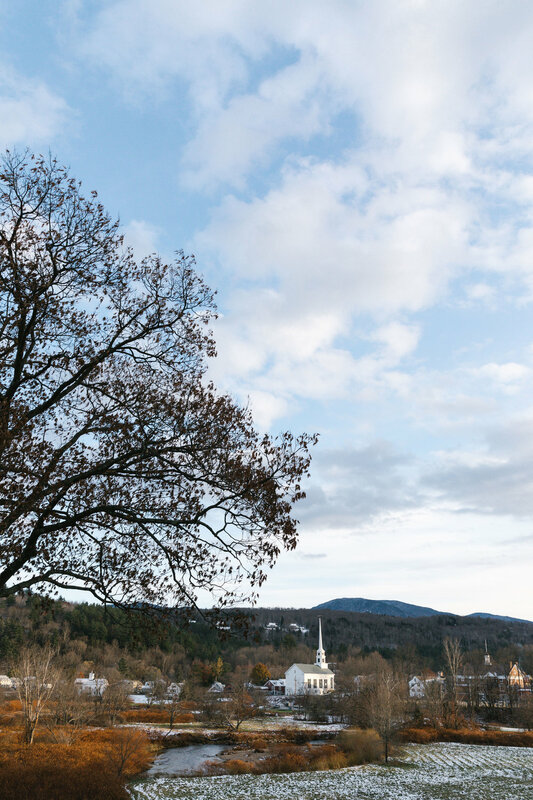 With fall weather wrapping up in Boston and with winter on the horizon, it seemed like the perfect time to head to Vermont for some mountain air. We left Boston bright and early on Sunday morning and had a couple of pit-stops planned along the way. First stop: Woodstock! I always like to stop at the Woodstock Farmers Market for a snack and to stock up on all the Vermont food stuffs. Think local cheese, maple syrup, chocolates, local popcorn, etc. After the farmer’s market we popped into Farmhouse Pottery because that’s a must. My friend Michelle is a potter and I knew she’d enjoy gawking at all of the beautiful ceramics with me. After that we made our way to Abracadabra Coffee for an espresso! This turned out to be a great idea because it was about that time for another coffee and also this coffee shop has the best vibe. I had a delicious espresso concoction called the Pineapple prism which is espresso, milk and a housemade pineapple, anise, ginger syrup. Delish! I’m not usually one for anything other than espresso with a little milk, but this drink perked us right up for the rest of the drive. 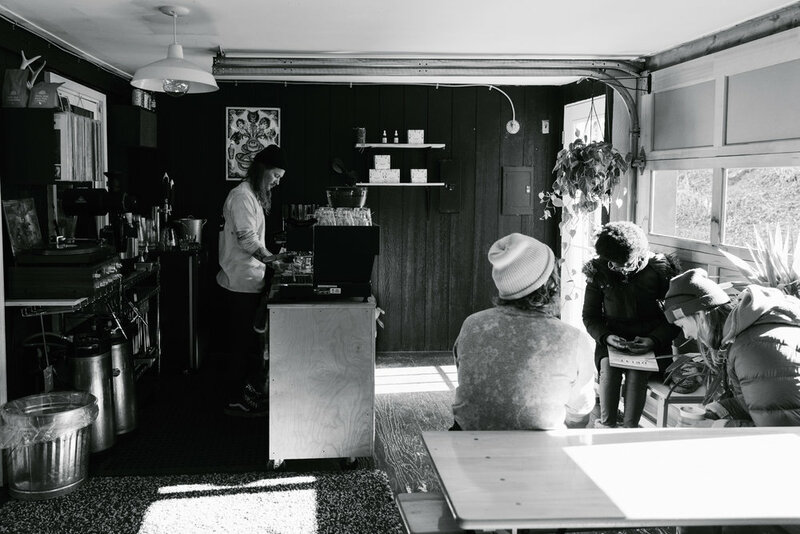 The owners are super cool, there’s a taco truck on Sundays and they let Elsie come inside which meant we could hang out and enjoy our coffees. And if you’re into CBD oil like me, they make a CBD-infused coffee in a can. Our next stop: Bohemian Bakery in Montpelier. I love asking friends for recommendations to places and this one came highly recommended by my friend Carey Nershi. I think her exact words were something like, “you must stop at Bohemian Bakery!”, so we did. As soon as we parked the car and walked towards the bakery we could smell the sweet aroma of baked goods. We had a really hard time deciding which pastries to try but settled on a chocolate babka, a fruit tart and a raspberry danish. Just as we were about to leave we saw a baker pull a tray of croissants and Kouign Amann out of the ovens so I took this as my cue to strike up a conversation and grab a pic of the croissants! We took our pastries to-go since Elsie was in the car but when we finally ate them we were blown away. AMAZING! All of them. After our pastry stop we hopped back in the car for Stowe. Once we arrived we were ready to stretch our legs so we went for a walk on the Stowe recreation path with Elsie. She loved it, we loved it, and it was the perfect way to land in town. After a long walk on the recreation path we strolled some more around town, popped into the general store and took in the adorable town sights. Elsie happy as a clam in Stowe, Vermont. Finally, we arrived at our adorable, two-bedroom cottage at Field Guide and settled in for the next two nights. Our cottage had a spacious living room with a pull out couch, a kitchenette and two cozy bedrooms each with king sized beds. We wish we’d brought more friends to enjoy it with us! This is the perfect place to stay with family on your next ski vacation. Later that night we got dinner at Doc Ponds (another excellent recommendation from a friend) and we were so satisfied! They had the best buffalo chicken wings and plenty of veggies on the menu to help us regulate after our pastry party. After dinner, we cozied up in our cottage and watched the Great British Bake Off before hitting the hay. What an action packed day in Vermont! We slept so well that night. We woke up super early the next morning for a sunrise drive but first we got coffee at PK Coffee in town. After coffee we drove up to the Von Trapp Family Lodge and hopped out to see some sheep up on the hill. After that we made our way back to Field Guide for breakfast. Our second day went by way too quickly. We went for another long dog walk with Elsie, stopped by the greatest little goat farm for some amazing goat cheese, went back to Doc Ponds for lunch again because why not and bought our weight in chocolate at Laughing Moon Chocolates before making our way to dinner with friends at Prohibition Pig. This trip went by WAY too fast and we were so bummed to leave the next morning. We woke up to the most beautiful snow falling just as we had to pack up and head back to Boston. 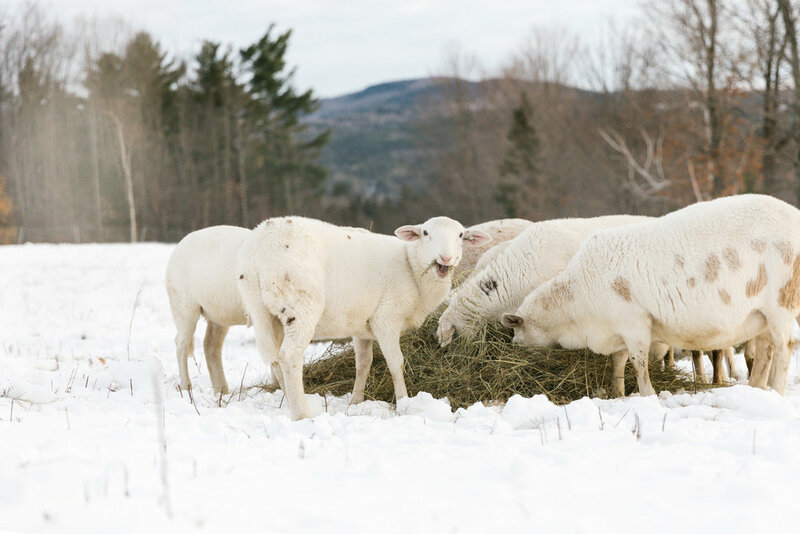 There are so many fun things to do in Stowe and I really can’t wait to return. Thank you, Field Guide, for the wonderful stay! 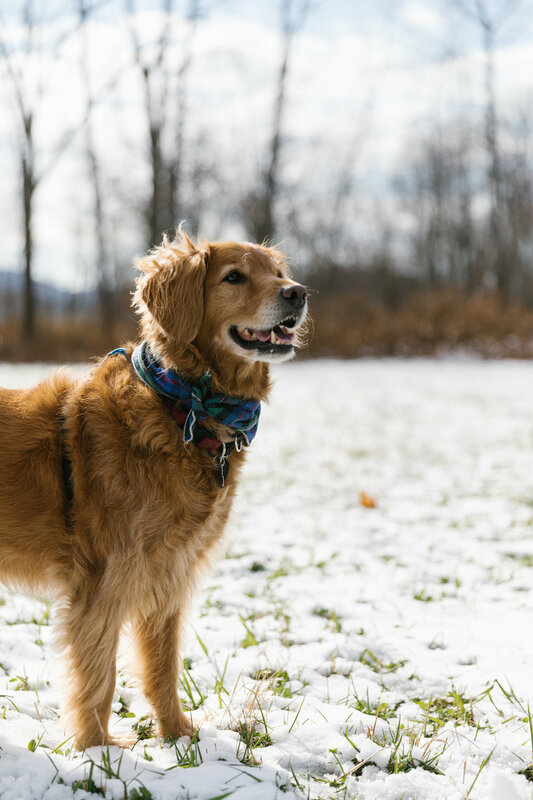 We’re so grateful to be able to travel to destinations like Stowe and have dog-friendly lodging. Have any of you been to Stowe before? Where do you like to eat in town? Comment below! Thank you Field Guide for collaborating on this stay. As always, all opinions are my own. Thank you for supporting the brands that support my blog!